Now that ChopSaver is being sold in a major national chain like CVS/pharmacy, people often ask me how we are getting the word out. It’s a basic question of awareness and one that every person who has a product or service they are trying to market has to figure out, whether it be an iPhone or a local plumber. How do you cut through all the advertising noise that we are all bombarded with in a capitalist society like ours? For large companies, maybe it’s a super bowl commercial. If you have a product, maybe you have people try samples in a store. Or maybe it’s through email or ads that pop up in social media feeds like Facebook and Instagram. I still hear and see radio and television ads all the time, so clearly, those “older” forms of media are still being used. In large cities, practically every surface you see has something plastered on it whether it be city buses, taxis or the sides of buildings. And we all still receive “junk mail” (or “direct mail” as we marketers prefer to call it), especially during election season. Since we don’t have the budget that many of our big-name competitors enjoy, we have to choose wisely. This photo is a perfect demonstration of my favorite tactic. After many years of trying, we finally developed a way to create small sample packets of ChopSaver. We mail them in bulk to both musical organizations and physicians’ offices. We also pass them out at trade shows and conventions. It allows people to try ChopSaver and actually feel how different ChopSaver is from every other lip balm. 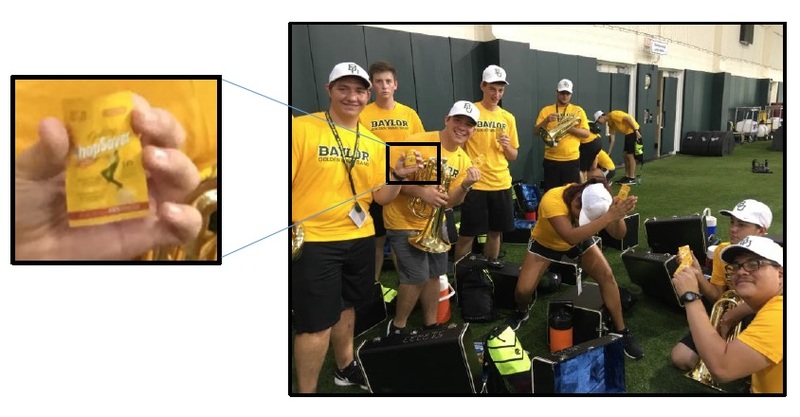 These are members of the Baylor University Golden Wave Band after having just received their samples. I never get tired of watching people try ChopSaver for the first time as it almost never fails to exceed people’s expectations. To me, this is the best example of “word of mouth” marketing! If you would like free samples for your band, click here!